When you are from a small town, I would argue that it is impossible to keep a secret. Everyone knows everything about everyone else; friends know each others parents, siblings, and pet’s names; teenagers know who lost their virginity to whom; and young and old farmers alike know whose piece of land was sold last week and how much it brought. However, when it comes to hunting for morel mushrooms, people become quiet. Morel hunters are unwilling to share their secrets with neighbors, lest they hunt the same patch of timber and find all of the mushrooms the hour before one looks under the first tree on a dewy, spring morning. The thought of seeing naked mushroom stems, especially large stems where prize-winning morels once stood, is enough to ruin an entire week for a morel hunter. Morels are hard to find, and the right techniques must be learned to have any luck whatsoever at spotting them. Because morel hunting is a well-kept secret, the mushrooms are highly coveted, and people who cannot find them on their own buy them for high prices. Morel-lovers will stop at nothing to savor the delicious timber fungi. During the ride in Papa’s Nissan truck, I prayed that people had not yet picked over the patch of timber near his farm. Papa, my brother, Alex, and I were dressed in layers of camouflage; we did not want the neighbor to see us sneak through his cattle yard and into his timber on the other side. He had not caught us in past years, as we had hunted there since I was in elementary school, so we figured we would be safe hunting there again that year. Papa, who was 68, was fairly young to be the grandfather of my 21-year-old self, yet he was beginning to show his age. His skin betrayed him with age spots, gray hairs were interspersed within his thick, blonde mustache, and his glasses rested halfway down his nose. Despite his age and slow walking pace, I knew he could make his way through the timber faster than I could dream of trekking through thorn bushes and over logs. As Papa drove just under the speed limit down the two-lane highway, I could taste the rich flavor of the morels that Grams would cook later that evening. While my favorite preparation was buttered and fried, I also liked breaded and fried morels. Grams breaded mushrooms in cracker crumbs, whereas my mom breaded them in flour. Both methods are equally delicious; as the earthy flavor of the morels combined with the fried taste of the breading or butter creates a flavor unlike any other on Earth. I was always amazed that mushrooms the size of my palm could shrivel down to the size of my pinky finger when cooked. I hoped to find at least 100 morels that day so we could have a full pan that night with plenty leftover. “How’s school going, Faith? What are you learning about?” Papa asked, breaking the silence. “That sounds neat,” Papa replied in his reserved, deep voice. “You will be able to use that to start your own business someday. Are you in any studio classes this semester?” Of course Papa was more interested in the studio art classes I took than my graphic design classes, as he was a self-taught artist and did not understand technology. I attribute my artistic ability to Papa; most of the adults in my family could not draw anything but stick figures. Papa had taken a few art classes here and there throughout his life, but he strengthened his painting and drawing skills with the help of his natural ability. When I was little, Papa, my sister, Cassi, and I used to spend hours drawing at the kitchen table every night we spent at my grandparents’ house. Papa made up contests to see who could draw the best fish or house or snowman. In our minds, he always won, but he asked Grams (who unfortunately had no artistic talent) to judge our drawings, and she usually chose Cassi or me as the winner to make us feel good. Without Papa’s guidance and encouragement, I may not have considered graphic design when it came time to choose my college major. “I suppose you would have to!” Papa laughed as he turned onto the gravel road leading to his 170-acre crop farm. “How is school going for you, Alex? Are you excited for middle school next year?” Papa and Alex chatted for a few minutes about how much Alex hated school before Papa pulled the truck to the side of the gravel road, parking it in the tall ditch grass. “Okay, Faith, why don’t you grab the bags and sticks, and Alex, you can help me unload the four-wheeler.” Papa had a tiny four-wheeler that was barely big enough for one person, let alone three (almost) full-grown adults. However, after I gathered three camouflage bags Grams had sewn for us along with the mushroom hunting sticks Papa had whittled from sturdy tree branches, I clambered onto the back of the four-wheeler, fighting Alex for limited space. After ten uncomfortable minutes of riding through waterways and up steep hills across the unplanted cornfield, we made it to the grassy area at the edge of Papa’s farm where we hid the four-wheeler. I distributed the bags and sticks, and Papa gave us the game plan. “There is that one tree just over the fence in Mary Nelson’s timber that we had better check under first. We’ve had pretty good luck there the last couple years. Then we can head over to Bill’s and make our usual loop,” Papa instructed. Alex and I took off through the grass, both wanting to be the one to find the first mushroom of the season. Papa decided to check under a couple other trees before meeting up with us. We carefully crossed a barbed-wire fence that separated the grassy area from the timber. We walked a short distance through the trees and thorn bushes before nearing the tree. I recognized it from past years, as it was tall and somewhat separated from other trees, surrounded by grass, nettles, and thorn bushes. (Did I mention mushroom hunting is only for those willing to suffer scratches and stings from bushes and weeds?) As we neared the tree, I studied it, trying to gauge if it was still a good tree. Papa had been training me for years about how to tell which trees to search under, when the weather was right to start hunting for mushrooms, and how to navigate around the timber using the sun to tell directions (not that I was any good at that part). Papa also taught me patience; it is necessary to be completely thorough when checking under a perfect tree because mushrooms blend in with their surroundings and are oftentimes mistaken for a leaf or a pinecone to the untrained eye. If you think that I am going to reveal my secrets about morel hunting, you are sadly mistaken. I will take them to my grave, only sharing them with my own kin. 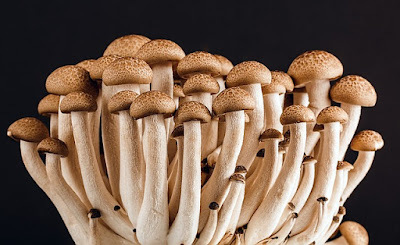 However, to give you a sense of what we were trouncing around the forest looking for, here are some tips from eHow.com about mushroom hunting in Iowa (with a few personal interjections). “Morels feed on dead trees of almost any type, but [dying and fallen elms, poplars or ash trees] are the most prolific.” The correct time of year to begin hunting for morels is April. One should hunt for morels in “state park forests” (good luck beating everyone else to these ‘shrooms) and always “ask permission from a property owner before hunting on private forested property” (or wear camouflage clothing and pray you are not caught). As Alex and I approached the base of the tree, we began using our mushrooming sticks to search underneath it, moving the grass and ferns that formed a fortress over the mushrooms, guarding them from view. As I moved my stick through the grass and weeds, I breathed in the intoxicating scent of the dirt and fresh greenery. After months of living within my computer screen at school, I had forgotten how amazing it felt to experience nature. I cherished the bright greens and yellows of the newly budding trees and delighted in the sound of the birds whistling in the air. Papa made sure each of his grandchildren enjoyed the outdoors in one way or another. Alex loved all aspects of the outdoors, so he and Papa became best friends while hunting, trapping, and fishing. Mushroom hunting had always been my favorite outdoor activity to do with Papa, although I also enjoyed fishing like the rest of my siblings and cousins. I felt a twinge as I cautiously moved around a thorn bush. A thorn had stuck my leg through my pants. I carefully grabbed the thin branch with my fingertips and removed the thorn from my clothing. While I untangled myself, Alex exclaimed that he had found the first mushroom. I was a little bitter that I had not discovered one first, but I rejoiced that the tree was still producing. A good tree produces for up to five years, and we had found morels under this tree for at least three years. A second later, I heard Papa’s footsteps approaching, snapping twigs in his path. “Did you find any mushrooms yet?” he asked, his eyes shining while he showed us the few inside his bag. “Yeah, I just found one!” Alex exclaimed again. “Shhh, Alex,” Papa hushed. “Remember this isn’t our property, so we need to be quiet.” Despite having to whisper, I found pure delight in spotting the fungi’s camouflaged bodies, one by one. I plucked each from the ground by their tan stems, making sure to pinch them off as close to the ground as possible, as the entire morel is worth eating. Morels’ intricate patterning always amazed me, the membranous network of concave divots forming their slender heads, attached to the cylindrical stems. I placed each delicate mushroom in my camouflage bag, and Alex and Papa did the same. “Look, Papa! I found a big one!” I said, feeling like a child again, sitting at the table and asking for Papa’s admiration on a drawing. “Wow, that’s a real whopper!” Papa said, using his favorite word to describe both large fish and mushrooms. “You could probably send it in to the newspaper for their ‘Biggest Morel’ contest and win a prize!” I soaked in his praise and thanked God for giving me a grandpa who taught me to find my favorite food. After fifteen minutes of looking under the same tree and finding over 20 morels, Papa announced that we needed to move on. He led the way through the small patch of timber to the barbed wire fence that hindered our entrance to Bill’s cattle yard. Pressing down on the bottom wire with his mushrooming stick and pulling the top wire up with his large hand, he allowed Alex and I to cross into the yard first. After we were safely on the other side of the fence (with a couple snagged shirts), I pressed and pulled the wire with all of my strength, using my stick as Papa had, to form a large enough opening for him to maneuver through. He made it through, although I could tell that his knees were bothering him, as he had to labor to lift them high enough to cross over the wire. Papa proceeded to lead the way, leaning on his mushroom hunting stick for support. He carefully looked around the cattle yard for the bull, protecting us by making sure we did not enter its line of vision. As we walked across the yard, I admired Papa’s craftsmanship on each of our mushrooming sticks. Papa’s was shorter than Alex’s and mine, although it was whittled like ours from a light-colored tree branch and had been varnished. It had a metal tip on the end that met the ground with each of Papa’s lumbering steps, and a piece of cord was strung through the top so he could put it around his wrist. Like my stick, Alex’s was made from light-colored wood and had a shiny coat of clear varnish to protect it. My mushrooming stick was my favorite because Papa had taken the time to carve a mushroom onto the top, which looked surprisingly like the real mushrooms for which we hunted. I was glad for our sturdy sticks, as they not only helped us find mushrooms but also guided us over fallen trees and through the wildly tangled brush within the timber. I watched Papa as he guided us toward the barbed wire fence at the other side of the yard. He looked at the ground as he walked (a habit he formed when looking on the ground for lost change in parking lots and mushrooms every spring), letting his walking stick guide him forward. I was glad that Papa was there to lead the way, or Alex and I would have been lost. After safely navigating past the bull, Papa again held the fence for us to pass through, and we repeated the same for him. We began our ascent up a grassy pasture, toward the mushrooms waiting in the timber beyond. “Are you and Tim getting ready for your wedding?” Papa asked. I accepted and appreciated Papa’s advice, although he had offered similar words throughout my life. He was one of the most hardworking people I knew, besides my dad. Grams and Papa were married as soon as they graduated from high school, 18 days before Papa had to leave for the Vietnam War. When he returned home, he started a successful construction company working day in and day out for several years. When he was not telling me about his working life, he sometimes mentioned wishing that he could have gone to college. He made me appreciate the opportunity of gaining a secondary education, and I was proud that I could tell him about my art classes in which I succeeded. I appreciated that he worked so hard so that his family, even the third generation, could have a good life. Although I sometimes wished that Papa would let me navigate through the forest so I could prove to myself that I knew how to mushroom hunt, I had always relied on him to guide the way. However, I thought of all that he had taught me and realized that I could probably find good trees on my own. I had watched Papa stand remotely, gazing up into the interlacing branches countless times before leading me to a bountiful harvest of mushrooms. “I’ll try,” I said hesitantly, looking up into the branches to prove that I could, indeed, lead us to the perfect tree and find a mess of mushrooms to fry for supper that night. As always, Papa was right about my abilities; I was able to spot good trees, only checking under an occasional oak or hackberry tree with no luck. Like my mushroom hunting stick, Papa was there to guide and teach me, helping me to realize my full potential.